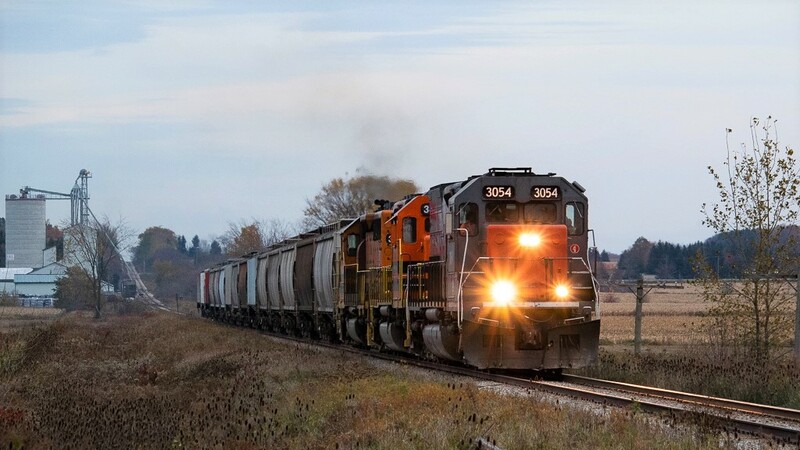 Railpictures.ca - James Knott Photo: I had caught 431 earlier that afternoon in the Rockwood area and headed west with it in hopes of maybe trying to get it again. After all, I had never even caught it before that day and GEXR’s days running from Mac Yard to Stratford were numbered. As most of you know, this is not an easy one to keep up with, so with work in Kitchener I decided to just get out ahead of it and hope for the best. As I waited west of Shakespeare, daylight was quickly fading and I was getting worried I wouldn’t get another chance at it. However, I finally I heard them on approach and got the ISO cranked for one more shot. Given Stephen’s recent post of CN 568 at Shakespeare, I thought seeing GEXR 431 here as well might be of interest to people also. | Railpictures.ca – Canadian Railway Photography – photographie ferroviaire Canadienne. Caption: I had caught 431 earlier that afternoon in the Rockwood area and headed west with it in hopes of maybe trying to get it again. After all, I had never even caught it before that day and GEXR's days running from Mac Yard to Stratford were numbered. As most of you know, this is not an easy one to keep up with, so with work in Kitchener I decided to just get out ahead of it and hope for the best. As I waited west of Shakespeare, daylight was quickly fading and I was getting worried I wouldn't get another chance at it. However, I finally I heard them on approach and got the ISO cranked for one more shot. Given Stephen's recent post of CN 568 at Shakespeare, I thought seeing GEXR 431 here as well might be of interest to people also. Nice shot James. I don’t believe I ever shot GEXR here, but glad that you got it before the end. Right. There’s not many wide open spots west of Kitchener. One by HWY 7 (late afternoon westbound required) and this, which is good both sides. Many more east of Guelph and one at Mosborough. Otherwise it’s grown in at most crossings. Haha yeah it was a shot I wanted so I went all or nothing in hope of getting it as yeah I wasn’t sure they’d keep going past Kitchener. Had trouble keeping up with it between Rockwood and Kitchener (getting only a shot in Mosborough and just barely at that) and it was unfamiliar territory for me speed-wise so yeah went straight to Shakespeare. Didn’t realize I had a chance at multiple shots west of Kitchener. Most excellent. Ballsy though, 431 could have died at Kitchener! Also chasing west of Kitchener was / is still easy between Kitchener and New Hamburg – only 25 MPH. Can easily get a two to four shots to baden then bee-line to shakespeare for one more. After that, it is over, chasing was and still impossible between hwy 7 and Stratford, one shot only. I should have done this shot in summer, would be amazing light when sunny.